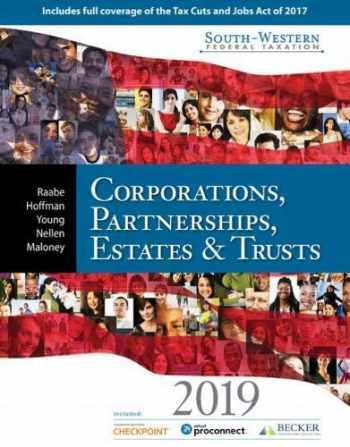 Acknowledged author William A. Raabe wrote South-Western Federal Taxation 2019: Corporations, Partnerships, Estates and Trusts (with Tax Prep Software & RIA Checkpoint, 1 term (6 months) Printed Access Card) comprising 1056 pages back in 2018. Textbook and etextbook are published under ISBN 1337702919 and 9781337702911. Since then South-Western Federal Taxation 2019: Corporations, Partnerships, Estates and Trusts (with Tax Prep Software & RIA Checkpoint, 1 term (6 months) Printed Access Card) textbook received total rating of 4 stars and was available to sell back to BooksRun online for the top buyback price of $65.43 or rent at the marketplace. Gain a thorough understanding of today's tax concepts and ever-changing tax legislation with SOUTH-WESTERN FEDERAL TAXATION 2019: CORPORATIONS, PARTNERSHIPS, ESTATES & TRUSTS, 42E. This reader-friendly presentation provides the most effective solution to help you master tax concepts impacting contemporary corporations, partnerships, estates and trusts. You examine the most current tax legislation at the time of publication, including the Tax Cuts and Jobs Act of 2017. Extensive examples, summaries and meaningful tax scenarios clarify concepts and sharpen your critical-thinking, writing and research skills. The book's framework effectively demonstrates how topics relate to one another and to the big picture. To ensure thorough coverage, each new book includes instant access to Intuit ProConnect tax software, Checkpoint (Student Edition) from Thomson Reuters and CengageNOWv2 optional online homework solution.